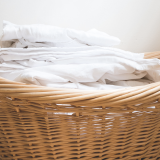 What Are The Most Effective Homemade Cleaners? Spring cleaning time is here again and many moms are choosing to mix their own cleaning and disinfecting solutions to help stretch the household budget. Here’s some guidance for distinguishing between cleaning and disinfecting chores and how to get the best disinfection results on the surfaces that need them. Cleaning and disinfecting are different tasks with different goals. In cleaning, water and detergent — and often a healthy dose of elbow grease — are used to help remove dirt and grime from surfaces. The goal of cleaning is to make surfaces look and feel clean. Disinfection takes it one step further — it helps destroy germs on surfaces left behind after surfaces are cleaned. We all want to have dirt- and grime-free kitchen chairs, right? Although that is not always easy with a family, under normal circumstances, kitchen chairs may be wiped down, but they do not require disinfecting. By contrast, food-preparation surfaces in the kitchen often do need disinfecting. For example, after preparing raw meat, fish, poultry or fresh produce on the kitchen counter, both cleaning and disinfecting are a good idea. That’s because these raw food items are often contaminated with foodborne pathogens like E. coli, Salmonella and Listeria. For many moms, the question is: What is the most effective product to use to disinfect household surfaces? Bleach, hydrogen peroxide, vinegar, lemon or lime juice and baking soda are some of the products suggested for use, but just how effective are they in destroying germs? A few years ago, a team of scientists asked that question and designed experiments to rate the performance of five common household products against foodborne bacteria. E. Coli, Salmonella and Listeria monocytogenes are frequent culprits in foodborne disease outbreaks and may be found as contaminants in food products brought into the home. These bacteria can survive on food contact surfaces for hours or even days at a time. Contaminated surfaces may harbor the bacteria that can then cross-contaminate other foods. Which Commons Household Products Are Most Effective Disinfectants? 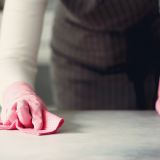 Vinegar, lemon/lime juice and baking soda were ineffective against the three common foodborne germs likely to lurk on surfaces in the kitchen. Hydrogen peroxide came in second place for knocking out two of the three common pathogens. Only a dilute solution of chlorine bleach (just one teaspoon of plain old laundry bleach in one quart of water) was effective against all three of the common kitchen germs. Smart, cheap, and effective! Chlorine bleach(0.0314% sodium hypochlorite) 1 tsp. bleach + 1 qt. water Make fresh solutions daily as bleach breaks down over time; degrades into mostly salty water as it destroys germs. Effective at room temperature.Do not mix bleach solution with other products. Hydrogen peroxide (3%) undiluted Use freshly poured product within a short period of time; degrades quickly into oxygen and water when exposed to light. What are your top spring cleaning tips? Tell us in the “Comments” section!